William Christenberry, who is 73, has been one of Washington's most important artists for something like 40 years, working as a painter, fine-art photographer, meticulous sculptor and careful installer of found things. But the best way back to the origins of all his varied work, and to the heart of what it means, is through a series of scrappy little snapshots that Christenberry made in the 1970s, shooting with a Kodak Brownie and getting his prints done at drugstore photo counters as he toured and contemplated Hale County, Ala., where his family is from. 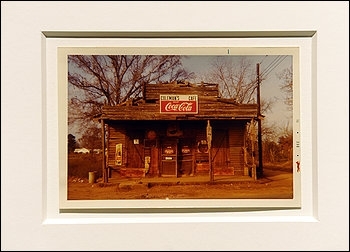 Compared to Christenberry's deluxe maquettes of Southern buildings, to his evocative assemblages of Alabama scrap or even to his large-scale color photos of the rural South, shot on 8-by-10-inch film and preternaturally sharp, the drugstore prints barely even seem to count as art. That's what makes them so wonderful and so important. They feel like they provide the most direct, intense, unmediated encounter with the reality that matters to Christenberry, without any artifying filter getting in the way. Christenberry left Alabama when he was 24 and has lived in the District since 1968. Yet almost all his art has been about his Southern roots, revisited on frequent trips home. Like so many artists, Christenberry's work seems to gets its start from an encounter with the world. And as with many other artists, the working-up of that raw material into finished art doesn't always lead to much improvement. Watching Leonardo da Vinci coming to grips with reality in a quick sketch is often as rewarding as seeing how he transformed that first encounter into the "art" of painting. When Christenberry first started taking photos with his Brownie, he thought of them as nothing more than "sketches" for paintings. It took his mentor, the great New York photographer Walker Evans, some of whose most potent images were made in Hale County, to let him know how much they mattered. In fact, they turned out to be the "sketching" that underlies all of Christenberry's art. In the photos at Hemphill, you can almost feel the moment when Christenberry, on yet another trip home, spots a church or a Coke sign or a car that interests him, squares it up in his Brownie and snaps a record of it. And the casualness of the snapshot helps make clear that what truly matters is the quality of the thing, rather than the virtue of the record that's been made of it. It's as though Christenberry's photos simply point a finger at the world and say "take a look at that," the way he himself might point and exclaim if you were driving with him down a Hale County lane. His photos don't seem to do the looking for us. But there's one more step that makes these old Brownie prints succeed so well. The modest piece of equipment that shot them, and the modest scale and manner of their printing, seem to fit right into the modest rural world that they depict. If the owner of one of the buildings Christenberry shot wanted a record of his home, you'd imagine him pulling out a Brownie just like Christenberry's, framing the scene square-on, as Christenberry does, and then heading down to the photo counter at Eckerd's to find out what's on the film, maybe running into that Christenberry boy -- the one who moved away and became some kind of famous artist -- as he orders up his prints. Christenberry has often included found objects from the South in his artworks. The photographs at Hemphill feel like the South itself, found and delivered up to us by Christenberry at his best. Those fading snapshots show the world from which all his art has sprung, but they're part of that world, too. Over time, these magical objects have collapsed the gap between Christenberry's subjects and the works of art that show them.